If you like shiny and stylish you have both with Manzini blazers. These fashion blazers are not for the timid with their designer styles that are sure to get you noticed. There are blazers and then there are Manzini blazers for fashion. 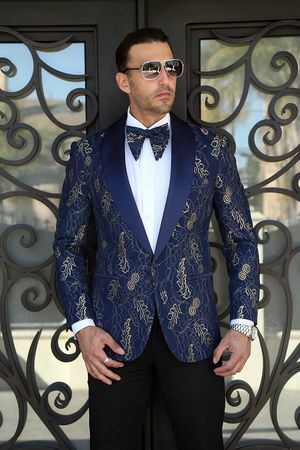 This fancy and unique blue blazer features unique shiny blue designer fabric with satin trim on the lapels and sleeve cuffs in a modern fit.